Krones AG said since installing its LitePac packaging system, the Bracca Group has increased sales by more than 30%. 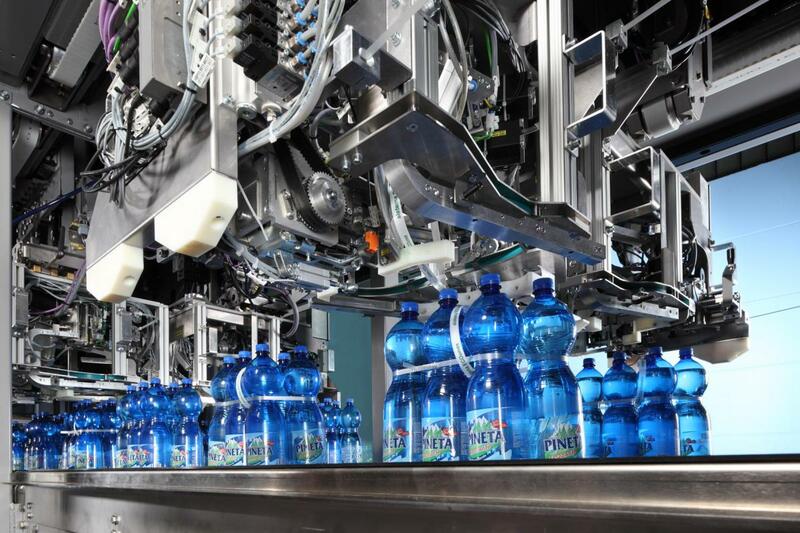 The Bracca Group was the first water bottler to operate the system worldwide.The LitePac process looks to replace shrink films for secondary packaging for PET bottle six-packs by producing strapped packs with an integrated handle. The machine, the EvoLite packer, includes a container infeed module and a container strapping module. In the infeed module, the containers are divided into two continuous lane flows. Four strapping units then create the LitePac packs in the container-strapping module. German beverage packaging machinery manufacturer Krones says the development was driven by its goal to create a resource-economical alternative to shrink film-wrapped packs. According to Krones, the LitePac strapping can be up to 50% less costly than shrink film. Krones calls this process “invisible” packaging. “Meaning sustainability in the truest sense of the word, embracing both ecological aspects and resource-economy to responsible perfection,” the company stated. The Italian supermarket chain Unes is the first food and beverage retailer to sell the Bracca Group’s mineral water brand Presolana U! in the new LitePac. Unes had actually set the ball rolling when the company initiated a project aimed at reducing the packaging for the mineral water brand. Evnetually Krones and the Bracca Group joined forces, and together invested a substantial amount of work in this project. In January 2011, Bracca ordered the EvoLite machine, which was integrated into the firm’s 24,000 bph PET line in a bypass configuration, and all the conveyors linked up. One of the biggest questions was how consumers were going to react to this new form of packaging. Since October of last year, Unes began supplying the 1.5-liter PET six packs containing the Presolana U! mineral water brand using the LitePac packaging. A comparison of Presolana sales achieved at Unes in January 2011 (shrink-wrapped packs) and January 2012 (LitePac) was up about 33%. Mordandi said energy savings are about 12.4% and plastics consumption was cut by 14.8% for the whole pack, including the bottles.